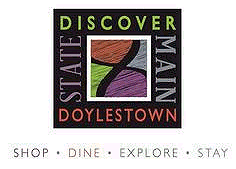 Doylestown is a place full of history and culture and the passionate people that create it. Nejad Gallery Importer of Fine Oriental Rugs, owned by Ali and Theresa Nejad, located at the corner of Main & State streets, has been one of the most important and established businesses in Doylestown since its inception 30 years ago. Nejad has provided superior quality and service to its customers who travel from all over the country including New York, New Jersey, Connecticut, to receive the Nejad experience. After customers visit Nejad for all their Oriental rug needs and canvassing the rest of the Doylestown shopping district, it is no surprise to find Nejad’s customers looking to explore the town’s local eateries. various cafés in between, Doylestown has it all. Today however at the Doylestown Business Alliance meeting, was a showcase of all the fine cuisine this town has to offer in its downtown area, and I was privileged to be a part of it. The event was promoting the annual restaurant week in Doylestown that is to take place next week. As you can imagine, the tasting and sampling of exclusive menu items was endless with more than 20 local restaurants on the scene. My favorite was from MOM’s, aka Maxwell’s on Main. The general manager Jason Long was serving a perfectly cooked piece of salmon accompanied by a corn salsa and a creamy sauce that had a kick, to top it all off. A close second, but on the other end of the spectrum, were the spoonfuls of chocolate-covered caramel being handed out by Puck’s own Chef, Michael, who I had the pleasure in meeting. On the other side of the room, through the hall, was the drink sampling contest. The winner here, for me, was the Freight House, which was serving up a deep crimson-colored shot infused with cranberry and orange flavors. All in all, this event was a huge success, firstly, for my taste buds, but, secondly and more importantly, for the local restaurants that work hard day in and day out to provide the people and guests of Doylestown with the utmost quality in their food, drinks, and service. An event like restaurant week brings Doylestown residents, visitors and the entire business community together (not only the restaurants but all businesses) into the downtown area where the people and business owners alike get to know one another through good food, good drinks, and great laughs.